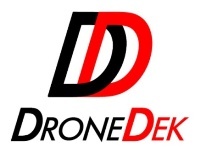 CEOCFO: Mr. O�Toole, would you tell us the concept behind DroneDek? 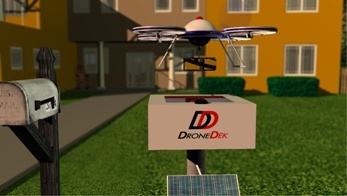 Mr. O�Toole: DroneDek is the mailbox of the future. Drones are going to be delivering multiple packages and different items and there is going to be a big need for a secure convenient hub that will ship and receive those items. Mr. O�Toole: DroneDek is going to be a whole ecosystem that will allow the user to literally ship and receive items and it is going to be app-based and all centered around convenience and security. If you have a package, you want to ship, simply get out your phone app and pull up any of the resident shipping companies such as Fedex, UPS, and DHL. Tap the �ship� icon and put your address in and when the drone shows up to pick up your package you will be notified that your parcel is on its way. Conversely, if you are expecting a new set of headphones you just ordered from Amazon, when they show up you will get a text and it will say your new headphones just showed up. You will know exactly what you got and when you got it. Drone delivery is going to open up a lot of new avenues of convenience that are not around today. Pharmaceutical deliveries may require a heated or cooled cargo area, which is one of our awarded claims in our patent. You will also be able to get a hot pizza, a cold drink, or perhaps just your room-temp mail. There is every convenience imaginable in the DroneDek through the long hours of brainstorming that were put in. DroneDek also has a heated door, so it can operate in any climate, solar powered or 110 volt power and more. CEOCFO: How does the package get in the box and how is it secure so that no one walking along the street can just reach in and get it? Mr. O�Toole: The DroneDek will have the mutual encrypted signal that it shares with drones that are on its frequency or platform. 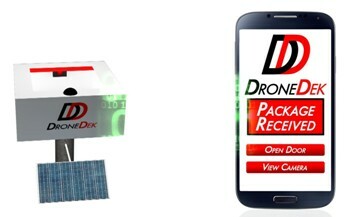 When one of those validated drones comes up to either ship or receive, it will send a communication to the DroneDek and the DroneDek will receive it, vet and verify it, and then the deck door will open and allow access by the drone to the DroneDek. There is a camera inside that will be recording and once the transaction is completed the door will close remotely and lock and the drone will take off. CEOCFO: Are the drones ready and are the shipping companies ready? Mr. O�Toole: Drones are ready. It is a multi-billion dollar industry already. Drone delivery is happening throughout the world. Virtually every Fortune-500 company has some sort of drone play that they are developing right now. There is no going back. Drone delivery will be ubiquitous in the very near future. CEOCFO: With all the UPS trucks and such, how does the interaction take place and where would the drones be coming from? Mr. O�Toole: All these things are being brainstormed right now. Just the same way you have hundreds of cars in an area or airplanes or other kinds of commerce, they have developed flight plans and they have avoidance systems. There are grids and aerial maps for drones to operate within and altitude levels above roads and things like that. All of these facets of Drone Flight have been thought out. The FAA is putting all of those restrictions and things together. There is smart software now that will dictate where a drone can and cannot fly. All that software is built-in just like a GPS where you type something in and there might be a road closure and the GPS already knows about that. It is not like the old days where you download software and now you are stuck, because 20 years later you have all of these new roads. Everything is real-time today and that was all adapted into the drone delivery sequence. CEOCFO: What do you see as the impediments or gateways to get all the logistics in place so that everyone will have a DroneDek? Mr. O�Toole: Convenience is what is driving all this. People want things now, not in a day or 5 hours from now. The retail sights of today are industrial warehouses. By that I mean that distribution is going to take over retail because it is not the same as it used to be where everyone wanted to go to a storefront. Today everyone is buying from their smartphones or computers, so it�s the day of warehouses. Therefore, everything has to be setup to move numerous packages to strategic proximities. Therefore, we will see warehouses popping up geographically central to those zones that can delivery quickly and strategically, they will be called drone zones. Specific drones will support geographically close areas for both getting product and delivering to nearby consumers. Brick and mortar is not going away, but there is a definite shift in demographics and how commerce is happening in shifting to the internet and that is where drones come in. CEOCFO: How will pickup and delivery work? 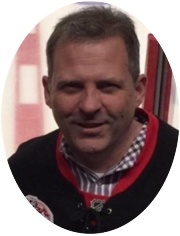 Mr. O�Toole: As far as delivery, there are different strategies being talked about. They are talking about having large trailers placed in strategic areas and drones would draw inventory from them and deliver to consumers. Large �Beehives�, which are like blimps in the sky, or large distribution centers would allow drones to access items and deliver them nearby. There are all kinds of things that are still being developed and talked about. CEOCFO: How are you able to get the patent? Mr. O�Toole: I have always been an entrepreneur and an idea guy. I believe that when one person has an idea, ten other people have the same idea. It comes down to execution and who is going to act on it and who is going to talk about it. I had this idea which I thought of literally driving down the road. I started thinking about delivery and brainstorming about how it would unfold. I came up with the DroneDek idea and as soon as I had the idea I literally started to work on it day and night. I tried to brainstorm every aspect and put the whole kitchen sink into it so that there was nothing left out. I called my patent attorney and within a week I had filed my utility patent. It turned out to be very lucky for me because I beat some other people out there just by days, who were working on the same thing. It goes back to the race mentality of execution versus talking about it. I am the only one with that patent protection in the United States for all of the claims that were awarded to me, and I think it is significant. Going forward any item delivered to a receptacle by a drone will have to use the DroneDek patent. CEOCFO: Where do you go from here? Mr. O�Toole: The market is going to determine that. The patent was just granted. I was impatiently waiting on working on things in a substantial way until I knew I was going to have those protections. I did not want to spend a ton of money until I knew I was good to go. Now that I am, the monetization or the model will likely be multi-faceted the way it is going to roll out. There might be an app with a subscription and you might pay $19.95 a month, which will give you access to a DroneDek. You might buy it outright, or there might be a buy the blade get the razor free kind of thing. It could be where with Amazon if you became a Prime member they would give you the DroneDek as part of your subscription. It could be a fremium model where the DroneDek is given to you, and you watch a 30 second commercial each day to access and get your parcels. There are a lot of different models on how this could monetize and I think the market will ultimately determine that. It may be a mixed strategy of all the things I just told you about. CEOCFO: How complex or simple are the mechanisms that will allow it to open and close and have all parts working? Mr. O�Toole: It is made by humans, so there is always the opportunity for a break-down. This will be the largest continuous infrastructure in the world once it is built out. Along with that it means there will be a large network of maintenance individuals and companies set up to support the infrastructure. The same way Fedex trucks break down delivering your parcels to you; DroneDek will have an occasional break down here and there. It is going to happen; it is just how are you going to react. When you buy a new car, you get the roadside assistance plan. When you get a DroneDeK there could be a roadside assistance plan along those lines. There could also be a backup, maybe your neighbor gives you access to his DroneDek and now your parcel goes over there and you get a notification that your neighbor received your package because your DroneDek was malfunctioning. This will be a huge infrastructure. It will be the gateway to every business and home in the United States and for that reason there will be a great support network that will make sure they operate continually. CEOCFO: What is it about you that is not overwhelmed by all the different parts of this process? Mr. O�Toole: I have always had a very positive attitude. I have always been a big picture guy. Some people want to do one thing and I want to do a hundred things. I always try to figure out how to do the biggest and the best, and I am optimistic about how to get there. When people come to me and say they have a problem, I tell my employees do not ever come in my office and say you have a problem, come in here and say I have a solution. People come to us because they have the problem; if we have the problem along with them then nothing is going to get solved. It is all how you tackle things. It is kind of corny but the only time we say no is when it is followed by the word problem, NO PROBLEM. CEOCFO: Are you seeking funding, investments or partnerships? Mr. O�Toole: Right now the patent is just newly issued. I am euphoric about the opportunity that is in front of me. I believe it is the biggest single market opportunity in the world today. I am not just saying that because it is my idea but if you compare it with anything else out there this is the truly scalable opportunity that will affect every business and home in the country. For that reason I am entertaining any kind of partnership, collaboration, if somebody came with the right opportunity to acquire the intellectual property, I would be open to exploring any opportunity. My real goal is to see this through and get to a day where you drive down the road and see DroneDeks lining both sides of the street and I can just relish in the fact that it was my idea and I took it from cradle to grave and made it happen. That is what I call accomplishment and that is what I am trying to do.